Earn 3 SB per $ when you buy JCPenney gift cards at MyGiftCardsPlus, powered by Swagbucks. JCPenney e-Gift Cards have no expiration date. Any unused balance will remain on your e-Gift Card. No service fees are deducted. 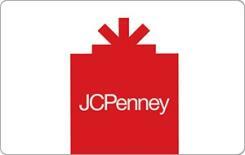 JCPenney e-Gift Cards are not redeemable on other web sites. JCPenney Gift Cards are redeemable for merchandise or services (excluding gift cards) in JCPenney Stores in the U.S. or PR and jcp.com. * Not redeemable for cash except where required by law. May not be used to pay on credit accounts. * Card has no value until activated. There is a 2 code limit for e-Gift Card and Gift Card redemptions for online orders. If you wish to use 3 or more codes or gift cards at once, please redeem at a JCPenney store.